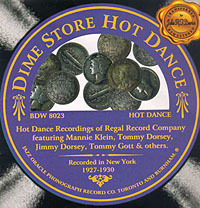 A selection of hot dance recordings from 1927 to 1930 made for release on the Plaza and Compo stable of labels. Features hot solo work by Tommy Gott, Bob Effros, Tommy Dorsey, Jimmy Dorsey, Arthur Schutt and others. Tommy Gott (t), (tb), Andy Sannella (cl,as), ?Larry Abbott (as,ts), (p), (bjo), (bb), (d), Leroy Montesanto (v). Note: Banner 6097 is credited to Hollywood Dance Orchestra. Al Lynch (v) dir. unknown (t), (tb), (cl,as,ss), (ts), Arthur Schutt (p), (bjo), (bb), (d). Note: Domino 181105 is credited to Pierrot Syncopators. Tommy Gott (t), (tb), possibly Don Murray (cl), (ts,bsx), ?Billy James (p), (bjo), (bb), (d). Tommy Gott and another (t), (tb), (cl,as), (cl,ts), ?Billy James (p), (bjo), (bb), (d), unknown (v). Note: Sterling 281037 is credited to Clarence Sherman’s Orch. Tommy Gott and another (t), unknown (tb), (cl,as), (cl,as,ts), (p), (bjo), (bb), (d), Scrappy Lambert (v). Note: This issue is credited to Rialto Dance Orchestra. Willie Creager (dir) 2 unknown (t), (tb), ?Andy Sannella and 2 others (reeds), Phil Romano (p), (bjo), (bb), (d). One of the reedmen doubles on baritone saxophone. One reed omitted; Arthur Fields (v). Note: Oriole 1392 is credited to Ted White’s Collegians; Crown 81142 is credited to Ernie Noble & His Orch. Tommy Gott and another (t), Sam Lewis (tb), Larry Abbott (cl,as,v), possibly Joe Dubin (as,ts), ?Billy James (p), (bjo), (bb), (d), Jack Kaufman (v). Note: These issues are credited to Dixie Jazz Band. The unknown trumpet player takes the trumpet solos on these sides. Tommy Gott (t), (mel), ?Tony Parenti (cl,as), (as,bar), (vln), (p), (bjo), (bb), (d), Tony Lombardi (v) according to the label of Oriole 1543. Note: This issue is credited to Billy James’ Dance Orchestra. Two unknown (t), (tb), (cl,as), (as,ts), possibly Russ Carlson (p), (bjo), (bb), (d), (v). Note: This issue is credited to Six Black Diamonds. Two unknown (t), (tb), ?Andy Sannella (cl,as), (cl,ts), Russ Carlson (p), unknown (bjo), unknown (bb), unknown (d), Jack Kaufman (v). Note: This issue is credited to Joe Dubin’s Dance Orchestra. Tommy Gott and another (t), (tb), unknown (cl); ?Andy Sannella (cl,as), Joe Dubin (ts), Russ Carlson (p), unknown (bjo), unknown (bb), unknown (d), Jack Kaufman (v). Note: This issue (bearing matrix 3994-2) is credited to Al Alberts and His Orchestra. Tommy Gott (t), (tb), (cl); (as,ts), Russ Carlson (p), unknown (bjo), unknown (bb), unknown (d), Jack Kaufman (v). Note: This issue is credited to Matty Crawford’s Orchestra. Probably Mannie Klein (t), Charlie Butterfield (tb), unknown (cl,as), (as,ts), (p), (bjo), (bb), Irving Kaufman (v). Note: This issue is credited to Buddy Bartlett’s Orchestra. Mike Mosiello-probably Mannie Klein (t), probably Tommy Dorsey (tb), ?Tony Parenti (cl,as), ?Andy Sannella (as,f), Joe Dubin (ts), Russ Carlson (p), unknown (bjo), unknown (bb), Joe Green or George Hamilton Green (d,marimba), Irving Kaufman (v). Note: This issue is credited to Imperial Dance Orchestra. Similar; Mannie Klein (t) and Tommy Dorsey (tb) definite; two of the reeds play clarinet; percussionist doubles on xylophone and vibraphone. Note: Romeo 1184 is credited to Dubin’s Dandies; Banner 0559 is credited to Roy Carlson’s Dance Orchestra. Similar; Bob Effros (t) and Tony Parenti (cl) likely; The Strollers Quartet (v). Note: This issue is credited to Dubin’s Dandies. Similar, Joe Dubin (ts) definite; unknown (hca) added; Irving Kaufman (v). Note: This issue is credited to Dubin’s Dandies.Note: This issue is credited to Fred Cooper’s Dance Orchestra. Crown 83017 does not bear a take number. Similar, with unknown (bjo) doubling on guitar; soloists include Mannie Klein (t), Tommy Dorsey (tb), probably Tony Parenti (cl,as), Russ Carlson (p); Jack Kaufman (v). Sterling 281287 is credited to Don Jose & His Orch. ; Jewel 5824 is credited to Dubin’s Dandies; Jewel 5840 is credited to Roy Carlson’s Dance Orchestra. Similar; soloists include Mannie Klein (t), Tommy Dorsey (tb), Scrappy Lambert (v). Note: This issue is credited to The Red Dandies. Similar, with unknown (vln) added; soloists include Mannie Klein (t), Tommy Dorsey (tb), Jimmy Dorsey (cl), Arthur Schutt or Russ Carlson (p), Irving Kaufman (v). Note: This issue is credited to Roy Carlson’s Dance Orchestra.